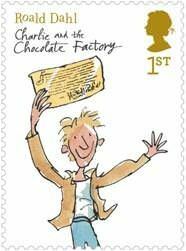 Roald Dahl stamps and a gloriumptious giveaway! Royal Mail is celebrating one of the nation’s best-loved children’s authors, Roald Dahl, with its first stamp issue of 2012. The presentation pack of six stamps celebrates six of Dahl’s most famous books that children and adults alike came to know and love, including Charlie and the Chocolate Factory, Fantastic Mr Fox, The Twits and Matilda. The stamps themselves recreate the magic of the Dahl books, using the beautiful illustrations of Quentin Blake. For the launch, Royal Mail Stamps is running a competition on its Facebook page to win Roald Dahl’s Scrumdiddlyumptious Story Collection featuring seven of his best-loved books, a pop-up book of Charlie and the Chocolate Factory and a Roald Dahl presentation pack. The stamps are also available via the Royal Mail online and on the Royal Mail eBay store. I have 5 Roald Dahl presentation packs to giveaway to readers of the gingerbread house. To enter (mandatory) simply tell me your favourite Roald Dahl character in a comment below. For an extra entry tweet about the competition using the Retweet button below. Don’t forget to leave a separate comment letting me know! The giveaway will end at midnight on the 22nd January. The winner will be chosen randomly and contacted using the email address or twitter name provided. If the winner does not reply within 3 days the competition will be redrawn. UK and Ireland only. Charlie from the choc factory! Hello, it’s lovely to meet you as we are sharing a Tots 100 slot this month. I love Danny the Champion of the world. What a lovely giveaway! My fav is Fantastic Mr Fox!! Fab! Hi my favourite is James and the Giant Peach. It brings back memories of being read to when I was little. My favourite character is Miss Honey from Matilda. The Twits is my favourite by a country mile, I love them chasing the monkey with there sticks. Excellent books for kids and grown ups, I am sure I heard there making a film about it. Great Blog Idea! I love George from George’s Marvellous Medicine, it was the forst Roald Dahl book I ever read and it’s still my favourite! I love and adored Matilda growing up, my 8 yr old now follows my addictioin! Thats a hard one – probably matilda but loved charlie and mr fox too! Matilda is my favourite, after I read it I used to try and make things move with my mind too! My favourite Roald Dahl character is Matilda!! Such a classic! It would have to be the BFG I can’t wait until my boys can enjoy his books! Veruca Salt! And if I don’t win, I’m going to screeeeeeeeeeeeam! Mr Fox, what a minx !! My fav charecter is Charlie Bucket. Fantastic Mr Fox – as his name says, he is just fabulous! My Favourite is Matilda, watched the movie dozens of times. The Witches! The book and the original tv series has always been one of my favourite characters! Grandpa Joe from Charlie & the Chocolate Factory. Fantastic Mr Fox! He really was a fantastic fox. My favourite is Danny the Champion of the World. When times were tough growing up, he was a real inspiration to me. Danny the champion of the world for me. My favourite is George from Georges Marvellous Medicine. I loved the book as a child and have enjoyed reading it to my two too. I also have good memories of Rik Mayall reading it on Jackanory. A perfect choice to read such a wacky story! I love the fantastic Mr Fox even before George Clooney was connected with him!!!! I love the BFG with his made up words. When i read it to my class the children goggle so much at Whizzpoppers! The whole family love the BFG – its such fun to read out loud! I love the BFG – he’s just so sweet and he was always my favourite as a child. Willy wonka is my favourite. Oh, to own a chocolate factory!! Charlie Bucket from Charlie and The Chocolate Factory! There are far too many amazing characters – although my fav is probably the BFG – he is rather adorable! Mine has to be Willy Wonka as well, or the Umpa Lumpas! I love the twits, Strangly though I find it more difficult to read as I have gotten older as it is a bit yucky!!! Must be showing my age!! James & his giant peach! Fantastic MR FOX…… Good luck to all……. Love the B.F.G he is so funny! Has to be Charlie who wouldnt want to explore a chocolate factory YUM!!!!! Has to be Mathilda! Fantastic character. Has to be the whizpopping, whisbanging BFG! Both myself and my son love Willy Wonka! He’s mad, but in a good way! I love Danny Champion of the World especially the bit where he drives his Dad’s car to try to find him. You can easily imagine yourself to be there. BFG is my all time favourite! My favourite characters have to be ‘The Twits’, they are absolutely revolting making them brilliant! Charlie Bucket for me, loved it as a child! my favorite character is the BFG!! Cos of his great big beard to hide food in it! I love matilda but favourite character has to be mrs honey!! James from James & The Giant Peach! My favourite character has to be fantastic mr fox. A cunning charmer. It has to be the lovely, sweet, kind Miss Honey from “Matilda” ! Maltilda by far, so strong when her family were against her! It has to be Matilda for me!